Buildings that host certain biological hazards, such as chemicals, may be required to invest in a cleanroom. The cleanroom is a specific room set aside to keep environmentally sensitive processes stable. You won’t have to worry about a contaminated environment or sterilizing areas. This can help you save time and money. Choosing a unique portable cleanroom can be a wise investment for any business. You will have the ability to expand the area as your needs change or get rid of the room entirely when your project is over. This helps you to get an affordable cleanroom that you can be proud to call your own. When choosing which modular cleanroom mezzanine to invest in, it is important to look for only the best. Finding the right cleanroom is a lot different than finding other modular buildings available. It takes more than working with a great company to ensure that your needs are met and your products are not contaminated. Companies like Panel Built can assist you in a number of ways. Not only do they have the experience to help you properly build or expand your cleanroom, they truly understand the importance of listening to your needs. There is a huge difference between an ISO 6 Cleanroom and an ISO 7 Cleanroom. This difference could mean the difference between a practical investment and just another office space. Working with Panel Built for your prefabricated non-metallic cleanrooms helps to take many of the hassles out of building. Whether you want a Class 1,000 cleanroom or a Class 10,000 cleanroom, Panel Built is willing to help with their team of professional builders. Making sure the cleanroom is modular is also important. Cheap modular cleanrooms do not need to be constructed on your property. Instead, they are built and delivered fully intact and ready to go. You will be able to reduce construction disruptions and keep your focus on business when you invest in a modular cleanroom! A major part of distinguishing one class of cleanroom from the other is the type of filtration system being used. Cleanrooms typically use a combination of HEPA and ULPA filters depending on what is being produced or managed. The idea is to remove as many partials from the air as possible. The airflows can be managed and changed to better clean the particles, creating a more sterile environment. Employing a positive pressure is another technique used by several companies to help keep particals out. Others choose to employ negative pressure, which helps to keep contaminants in. Either way, your modular cleanroom can be fully customized to fit your needs. You will be able to find the most efficient methods for controlling contaminates. Should your needs change later, Panel Built can easily modify your portable structure. Most companies looking for cheap available ISO 6 cleanrooms for sale know the value of being cost-effective. Because every cleanroom is externally constructed, you do not need to worry about your business having downtime. You will simply place the cleanroom in your facility and begin using it right away. Many people worry that the quick construction will lead to bad quality. In fact, the opposite is true. While companies like Panel Built work at a fast pace, they have the experience needed to create top-quality wall systems for modular cleanrooms. They use the same durable materials that they would for their modular buildings, which means they are always up to code and will last for years. This helps you get the best value available. Your modular cleanroom mezzanine should come from a company that is known for producing only the best. There are a lot of laws and regulations regarding cleanrooms. Working with an experienced company can help you make sure that you are compliant and that you can take full advantage of your new cleanroom right away. 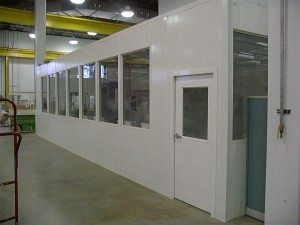 Panel Built, a company that specializes in prefabricated buildings, has several years of experience working with companies in need of cleanrooms. They understand many of the local and state regulations, which allows them to provide you with suggestions. Their personalized attention and excellent eye for detail makes it possible to rest assured knowing you are getting nothing but the best. The company can also work to expand your cleanroom if necessary. Many companies start with one cleanroom for manufacturing and then add more once they expand. Emergency eye wash stations and showers can also be added to the room with ease. It is important to remember that your modular cleanroom is an investment. As you invest in your new asset, you will want to make sure that it is durable and uses only the best materials available. This will help you to get the overall best value for your money while you meet your business’ needs. With 19 years of experience, Panel Built is a top choice for all wall systems for modular cleanrooms. 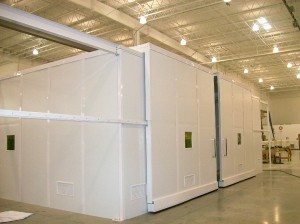 Your custom-built modular cleanrooms can be created exactly to your specifications. The company has a satisfaction guarantee and top-notch customer service representatives that are ready to answer any questions that you may have. Contact Panel Built today to see how affordable a new cleanroom for your facility can be.